Straight from the halls of Canterlot High, the My Little Pony Equestria Girls dolls are 6 best friends with a flair for fashion and fun! Your Pinkie Pie doll comes stylishly dressed in an ultra-chic look and features her signature cutie splash, a unique design similar to the cutie mark on her pony alter ego. She comes with an interchangeable fashion skirt and shoes, and you'll love sharing styles between her and other My Little Pony Equestria Girls dolls (each sold separately). She also has her very own Canterlot High membership ID card! 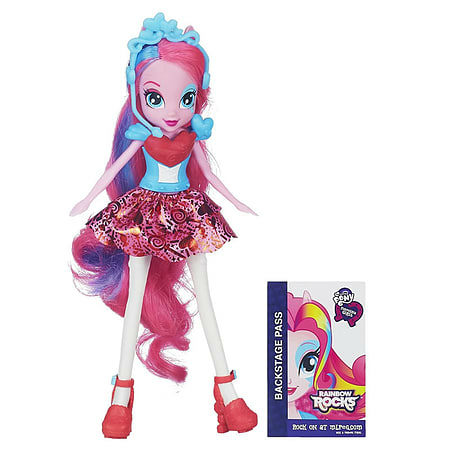 Trade skirts and shoes for the ultimate fashion fun with your super-stylish Pinkie Pie doll! Doll comes with skirt, shoes and collector card.